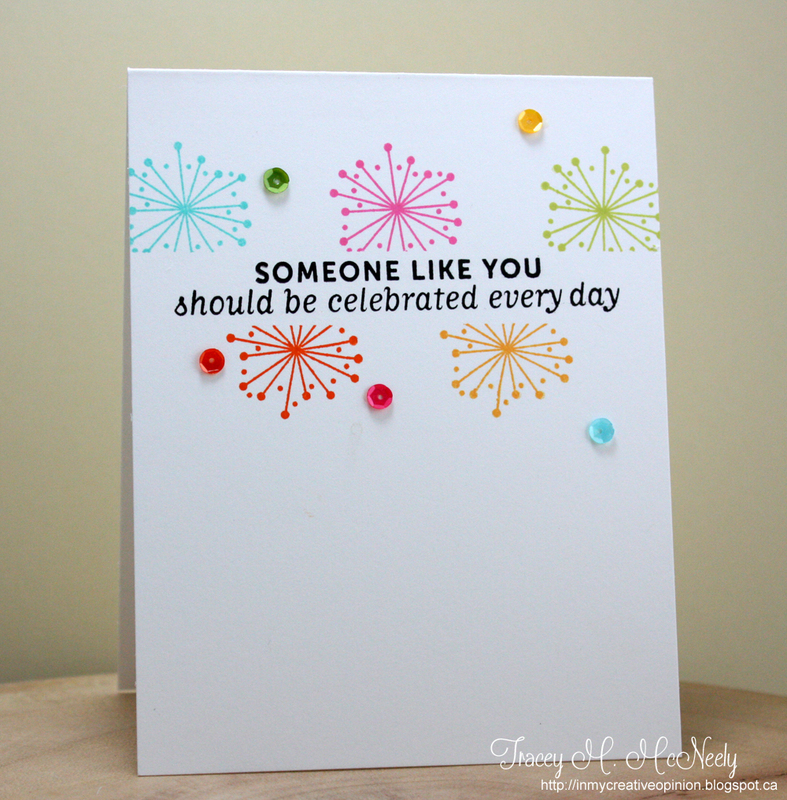 Today I so excited to share a card with you as Guest Designer for CAS(E) this Sketch #84! Chrissy asked me to join the team again this week and play along with the newest sketch! Before I stamped my images I ran a piece a washi tape across the card as a mask so that I could add my sentiment there later. I stamped my fireworks over the washi so it would not stamp the whole image on my card. I removed the washi, stamped my sentiment and of course added a few sequins for good luck. I love how many uses their are for washi tape. Seriously, how did we live before Post-it Notes and washi ? So here is my interpretation of the sketch...hope that you come along and play this week! Your masking looks amazing, Tracey! Beautiful stamping - such a fun card! 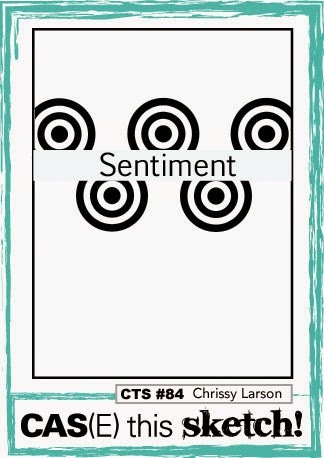 I was so excited to see that you're guest designing for CTS this week, Tracey I love your card-- fabulous take on the sketch! Super fun card and what a great idea to mask with the washi tape. So exciting to have you as a GD...again! 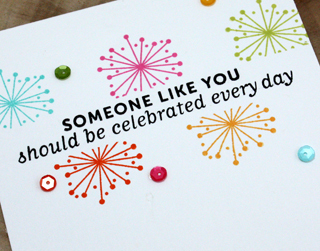 Love your "fireworks"--such a fun celebratory card! LOVE this card!! Congrats on the guest design spot!! Ooooozing with summer cuteness Tracey! Tracey...this is just so cute and so fun! What a sweet design and those star burst are amazing with all the festive sequins...so fun! Congrats on your Guest DT spot, Tracey! I love your take on the sketch...your fireworks are so fun, and I love your choice of colors! Love the pretty sequins, too! Awesome card, Tracey! You create the most fabulous CAS cards! Woohoo! Congrats, on the GD! And your card is AWESOME!!! Love it! Fantastic, Tracey! love your sweet design!!! Hugs! Great idea to use the washi tape as a mask...really good idea! Going to copy that one! Congratulations on your GD spot, Tracey! I love your take on the sketch! Very fun and colorful fireworks. Hey Tracey! Congrats on your GD spot!! I made a card like this months ago so now I have to rattle my brain on what I can do to fulfill this challenge. The colors are amazing and the sentiment is perfect. This is so festive! Love the rainbow of colors--including the fun sequins. Congrats on your guest designer spot! Oh my gosh, Tracey! This just makes me so incredibly happy!! Those bright colors, the happy fireworks - it's seriously DREAMY!! I love this sketch...and your card feels like fireworks! So fun! yay! What a fun card Tracey! Congrats on your guest design spot! Your masking is spot on and this turned out so cool! Congratulations on your guest spot Tracey! So very much deserved! Your card for the new sketch is so delightful! Must remember masking off the sentiment too!! It looks wonderful here. More gorgeous color combinations! Congratulations on the guest design! awesome job with the sketch darling and I love all the color! This is completely gorgeous and so perfectly done!! The colors are awesome and they pop right off the page and I adore the exact placement of all those wonderfully colored sequins!! So impressed by this card!! You're such an inspired, inspiring GD, Tracey! Not only is your card jaw-dropping, awe-inspiring gorgeous, but using washi to mask the sentiment strip is pure brilliance! Fabulously awesome!